We are working with the Province to advance the design and construction of the Broadway Subway, a tunneled extension of the Millennium Line SkyTrain along the Broadway Corridor from the existing VCC–Clark Station to Arbutus Street. Creating the Broadway Subway is the top priority from our Transportation 2040 Plan. Vancouver City Council endorsed a SkyTrain extension from Arbutus St to UBC. The Broadway Corridor stretches from Commercial Drive to UBC, and connects jobs and innovation hubs in our region, including Vancouver General Hospital (VGH) and UBC. The Corridor is currently served by the 99 B-line, the busiest bus route in Canada or the USA. At Commercial Drive and Broadway, 2,000 people are left waiting for the next bus every morning. Every year, 500,000 people waiting at bus stops along this route get passed by at least one full bus. Why build the Broadway Subway? Broadway is a regionally important and growing corridor. Central Broadway from Main Street to Burrard Street is the second largest employment centre in the province after Downtown Vancouver. Half of all people working in the Corridor commute from outside of Vancouver. Over 85,000 people and 100,000 jobs are located in the Corridor with 30% more people and jobs expected by 2041. 47% of all 99 B-Line bus passengers heading westbound from Commercial-Broadway Station travel to stops in Central Broadway (including VGH), with 44% to UBC. Currently, regional destinations like VGH (the largest hospital in the province) and UBC (Western Canada’s largest university) lack sufficient connection to the regional rapid transit network and other important regional destinations. Metro Vancouver will welcome one million new residents and 600,000 new jobs over the next 30 years. Growing congestion slows the movement of goods through our region and the Broadway Subway will help reduce this congestion. There are over 110,000 transit trips on Broadway buses every day (comparable to the Canada Line). Travel times on the 99 B-Line are unpredictable (25-45 minutes depending on time of day) and this discourages transit use in the Corridor. Transit on Broadway is at capacity for much of the day: even with regular bus service every 2 to 3 minutes, over 2,000 passengers are left behind at Commercial–Broadway Station each morning. Transit in the Broadway Corridor should handle the number of passengers today and accommodate long-term growth. For example, research at UBC has generated 137 spin-off companies (95% in BC), with more than $4 billion in sales and 40,000 person years in employment. The Greenest City Action Plan and Renewable City Strategy have set targets for carbon reductions and increased transportation mode share for sustainable transportation, such as rapid transit. Our Transportation 2040 Plan sets a target to reach 33% of trips to be made by transit. With more people able to take faster, more convenient transportation east-west across the city, we will see an increase in transit ridership. The Plan also sets a vision for compact, complete development supported by transit. We strive to build complete communities that bring people closer to their daily destinations and make walking the easiest and most convenient option for many trips. For over 15 years, we've worked with TransLink to study the best possible transportation option for the Broadway Corridor. Here’s what we’ve learned so far. A tunnelled SkyTrain extension allows for the highest number of travellers and ensures that the new system retains the capacity required for the region’s growing needs. A tunnelled SkyTrain extension reduces the need for transfers at Commercial-Broadway Station – the region’s biggest transit bottleneck. 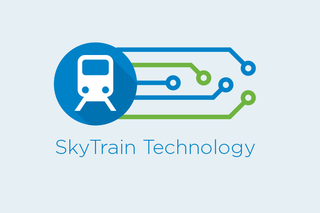 SkyTrain technology has the lowest operating costs per kilometre and per passenger than other technologies like light rail transit or bus rapid transit. Because SkyTrain technology is driverless, TransLink can easily add or remove cars to accommodate demand. Underground transit will free up road space for more efficient goods movement and vehicle transportation. The SkyTrain extension would cut travel time from Commercial-Broadway to Arbutus in half. People commuting from Coquitlam Centre Station would reach Central Broadway in about 40 minutes – as fast as by car. The Mayor’s Council vision for transportation in the region outlines the need for the Broadway Subway to help meet our collective transportation needs. The Broadway Subway (marked in orange) has six potential stations. The station locations are approximate. The City is responsible for the streets, water pipes, sewers, development, land use, and transportation planning in the corridor. We also represent the businesses and residents along the Broadway Subway. As a partner on the delivery of the Broadway Subway project, we offer advice to the Province on the design of the stations and construction planning. Learn about the first stages of the Broadway Subway Project. View our guidance principles and documents for this project. This is the start of a comprehensive planning and engagement process for the area of Broadway between Clark Drive and Vine Street.